The Which Greek Island Corfu beach guide gives an in depth look at the best beaches in Corfu. With the island being so long from north to south, most people wont want to spend the couple of hours travel time to visit the beaches at the other end of the island so this page is great for helping you to pick the beaches that fit your needs but are also within a short journey of where you plan to stay. Halikounas, more of a sand dune than a beach, it separates the Ionian sea from Lake Korission in the south west of the island. With it being so large you’ll always find some space to yourself and there’s a kite surfing school for the more adventurous. Easy to get too, plenty of parking and remote enough for an all over tan if you fancy it. Kalamaki, another huge beach, this time in the north east of Corfu. It stays shallow for a long way out making it perfect for little people or weak swimmers and has a wealth of tourist facilities to keep you entertained. Glyfada, this popular beach is in the middle of the island and offers a good mix of gorgeous scenery and an upbeat atmosphere, not to everyone’s taste but if you like a bit of music and water sports then Glyfada is a great choice. The most popular beaches in Corfu tend to be those based around the larger resorts. Places like Sidari, Kavos and Glyfada all have very popular beaches with tons of things to keep youngsters entertained as well as a wealth of amenities like sun loungers, water sports, tavernas for food and drink as well as gorgeous scenery. There are a number of fantastic secluded beaches, most of which you wont find on the internet, so travelling round the coast to see what you can find it a great idea. There are places like Myrtiotissa beach as well as Kerasia and Agios Spyridon that are ideal if you simply want to get away from the crowds of the main beaches, not sure you’d really call them secluded though. 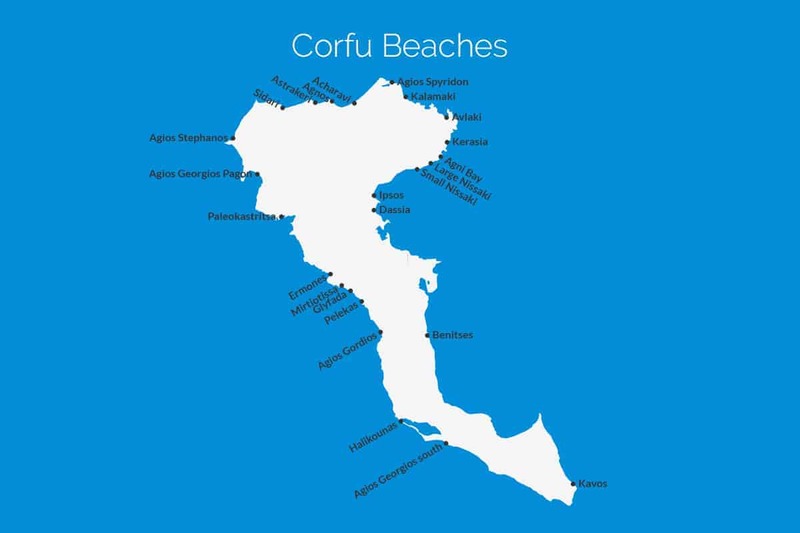 Listed below are the 25 main beaches on Corfu, all you have to do is click the ones you are interested in and that’ll take you to a page that gives you a more in depth look at that particular beach with descriptions, map, quick look icons and much more. Alternatively click a filter to narrow down the list of beaches to just those that have the particular characteristic that you find desirable. When you choose a filter it removes any previous filters that were applied. Acharavi is a long shingle and sand beach on the north coast. The water at Acharavi is shallow making it great for kids. There are plenty of shops and cafes that line the edge of the beach making it easy to get food, drink and toys if required. There are water sports to keep thrill seekers entertained and umbrellas and sunbeds available to hire. The sandy beach at Agios Georgios in the north of the island is long and wide, particularly in the middle. Agios Georgios offers all the facilities you need, there are umbrellas and sunbeds to hire, water sports like jet skis, paragliding, banana boats, canoes and wind surfing. There are showers available and tavernas for food and drink. Agios Georgios South is a long sandy beach that lies just south of lake Korission on the south west coast and is surrounded by olive groves. There is a full set of facilities here including sunbeds and umbrellas to hire, water sports, toilets, changing facilities and plenty of beach side tavernas. There’s also loads of places to get food and drinks. The long golden sand beach at Agios Gordios stretches for 1.5km and has crystal clear water. You can hire sunbeds and umbrellas, boats, canoes and snorkeling equipment. There’s also water sports available too. The only thing to look out for at Agios Gordios beach is the strong currents that sometimes affect the west coast beaches. Agios Spyridon is a lovely sandy beach that slopes gently into the sea making it ideal for kids. There are umbrellas and sun loungers available to hire, a beach bar for food and drink as well as showers, toilets and changing facilities. Despite all these useful amenities and the natural beauty of the area the beach remains pretty quiet. Agios Stephanos beach, sometimes called San Stefanos, is located on the north west corner of the island about 35km from the capital Kerkyra. The beach is over a mile long, has soft sand and shallow water making it perfect for little ones. Although pretty popular, due to it’s size Agios Stephanos beach never feels crowded. Agni Bay is an unspoiled shingle and sand beach on the north east of the island. It has a steep, winding road heading down to the bay which can be narrow in places but it is accessible by car and has a car park at the bottom of the road. There are three tavernas on Agni Bay, each one offering free sunbeds to customers. Agnos is an organised beach on the north coast just west of Roda. As it is on the edge of Agnos village there is parking available and the usual amenities like supermarkets and tavernas. Agnos beach is sandy and shelves gently into the sea which makes this a good beach for families as little ones can play safely in the shallows. Astrakeri is on the north coast of Corfu between Roda and Sidari. It’s a large rustic beach with minimal facilities, it’is mainly sand but with some pebbles in places, the water is shallow which means it’s ideal for kids, it does drop steeply once you get a bit further out so be sure that weak swimmers stay in the shallow areas. Avlaki beach is in the north of Corfu, between Agios Stefanos and Kassiopi, it’s a quiet pebble beach and the sea is clear making it the perfect spot for snorkelling. There are often stronger winds in the north so you may find the sea can be a little choppy. Because of the winds, pebbles and proximity of the road the beach it’s not ideal for children. Benitses is a sand and pebble beach on the east coast, about 15-20 minutes south of Kerkyra, it has calm waters and is well sheltered from the wind. Benitses is an organised beach with tavernas, sunbeds and umbrellas as well as showers. There are water sports available and the beach is great for swimming. Dassia is a long but narrow shingle beach on the edge of the village of Dassia, it has several beach bars and is lined with trees offering some shade if required. It’s organised with a couple of rows of sunbeds and there is also a platform around the middle of the beach where you can dive into the crystal clear water. Ermones is a sand and pebble beach on the west coast of Corfu directly in line with Kerkyra. The beach is surrounded by dramatic lush green hills making this a pleasant place to spend a day or two. The hills also mean that it doesn’t get too windy and the sea remains calm which is great for weaker swimmers. Glyfada is a popular beach on the west coast of Corfu, roughly in line with the airport. The beach is surrounded by rocky, tree covered hill side, has soft golden sand and beautiful clear water so it’s easy to see why it’s so popular. On top of the idyllic scenery Glyfada has all the usual tourist facilities including a good selection of water sports. Halikounas, often called Chalikounas, is a vast sandy beach on the south west coast of Corfu, right on the edge of Lake Korisson. The beach has soft golden sand with some rocks. There are a couple of tavernas, one at the start and one around the middle. Around the tavernas you’ll find the organised sections with sunbeds and umbrellas to hire. Ipsos is a narrow but very long sand beach with pebbles in places that’s located on the east coast of Corfu about 15km north of Kerkyra. With shallow and calm water, Ipsos is great for children and with water sports available and bars, shops and cafes lining the road that runs behind the beach adults will like it here too. Kalamaki is a large sandy beach on the north east corner of Corfu. It’s in the bay of Apraos and that’s why it’s sometimes referred to as Apraos beach. There are multiple tavernas around the middle of the beach serving food and drinks to keep you refreshed, the middle of the beach, near the tavernas is also where it is generally the busiest. Kavos beach is a 2km stretch of sand on the south coast, it’s on the edge of Kavos town and for that reason it’s ideal for the 18-30 crowd, it offers water sports including jet ski, banana boat and doughnut rings as well as other activities like bungee jumping and bungee catapult. As Kavos is a popular with tourists so is the beach. Kerasia beach is located up in the north east corner of Corfu, it’s a picturesque tree lined pebble beach with great views out to Albania. Kerasia is a fairly quite beach, there are sunbeds available to hire as well as a taverna and beach bar. The end with the taverna is the popular end with the other end being more quiet and relaxing. Large Nissaki lies slightly north east of small Nissaki and it’s a long but fairly narrow shingle and pebble beach which is home to a few places to stay, the hotels have trendy seating areas, sun loungers as well as table service for your food and drink. Large Nissaki also has water sports to keep youngsters and thrill seekers entertained. Myrtiotissa is a secluded beach on the west coast that is mainly used by nudists. There is a small beach bar but no other facilities. Mirtiotissa beach is tricky to get to, there’s a narrow difficult but passable road that takes you there. If you’re worried about the road then the best plan might be to leave the car at the top and walk down. Paleokastritsa is a fairly small bay belonging to the village of the same name in the north west of Corfu. As Paleokastritsa is a popular resort the beach gets packed in the summer months but it also means it has everything you need from sunbeds to beach side tavernas, water sports to boat hire. the beach itself is part sand, part shingle. Pelekas beach is large and sandy and never feels over crowded. It has calm waters that stay shallow a fair way out making it great for kids as they can safely build sandcastles, dig a hole in the sand or play in the shallow waters without fear of it suddenly dropping off. Pelekas beach is on the west coast beneath the village of the same name. Sidari is a long sandy beach on the north coast, as Sidari is one of the most popular resorts on the island the beach is busy with lots of sun loungers, tavernas, water sports, pedalo hire and ample parking. Sidari is a good place for the kids as the water stays shallow a long way out and the waves are fairly small. Small Nissaki is a tiny pebble beach, there’s a single taverna perched on the rocks above which makes the area the perfect spot to enjoy the fantastic views. Small Nisskai beach is good for kids as it’s a sheltered bay so there’s not too much current or winds but it does get deep so just make sure they stay in the shallows. We want Which Greek Island to be as accurate and informative as possible, so, if you notice anything wrong with the Corfu Beach guide or any other page please let us know. We’re also on the lookout for great photos to show people what the places we’re describing are like. If you have photos from any of the beaches in Corfu or from any of other island on the site then we’d love to see them, simply click the button below to go to the photo upload page. Thanks.